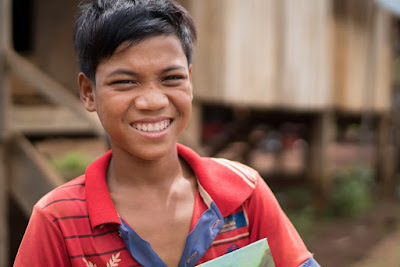 Ratanakiri, Cambodia, December 2018: 12-year-old Bajamson studies in the fifth grade. He lives in Kak commune in the Borkeo District of Ratanakiri. The province of Ratanakiri is located close to the Cambodian and Vietnamese/Laos borders, a nine-hour drive North East of Phnom Penh. Ratanakiri is best known for its beautiful waterfalls, a lake in the middle of a mountain formed by an ancient volcano, and as the destination from which trekkers leave for their jungle excursions. Like the rest of his village, Bajamson lives in a wooden house, built on stilts. When he isn’t busy studying, he routinely helps his family with chores on their farm, situated on a small plot of land. 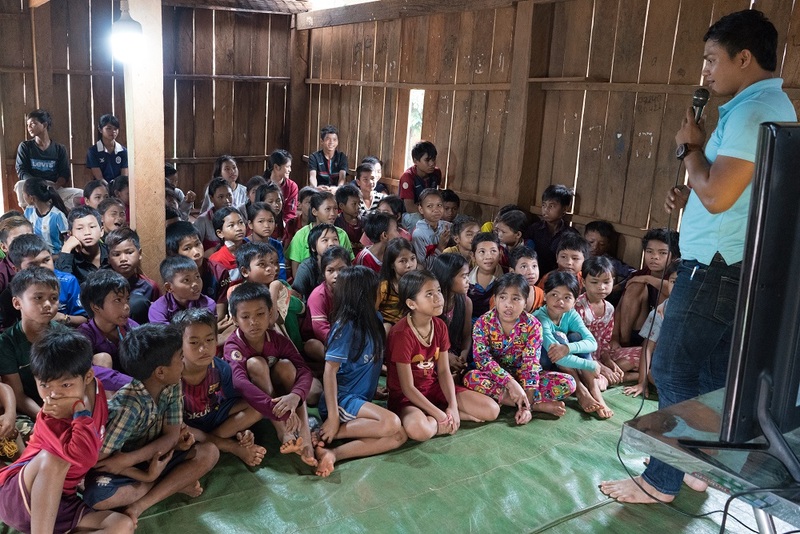 Today, however, will be different as SIPAR—a non-governmental organization that promotes education, health, and nutrition—has come to his village. It is 11 a.m., and Bajamson joins more than 50 curious and excited children, aged 8-17, inside a small wooden home to view a UNICEF produced TV series called Prai Krala (English title: The Magic Classroom). As of August, four episodes were already completed and shown in several communities, with ten more episodes in production. The series aims to teach children about issues related to health, nutrition, WASH (water, sanitation, and hygiene), and more. a TV series produced by UNICEF. The show features two central characters—a school girl and boy—in a classroom where they learn about a new topic each episode through entertaining interactions with various creative elements such as a ‘magic’ cupboard, a skeleton friend, and other unique guests and animations. When the children finish watching the episode, the facilitators from SIPAR invite them to come to the front of the room and answer questions about what they have learned. Bajamson is one of the first to volunteer. He explained that initially, he was very nervous to go to the front and answer questions. But after he did it, he was happy he had the opportunity to speak in front of the other children because it gave him a lot of confidence. Bajamson loves sports and hopes to see an episode in the future that features football. His favourite subject in school is Khmer literature, and he plans to write books in this genre when he grows up. It is now 12 p.m., and Bajamson has left to join the other village children for lunch. But before he went, Bajamson said that he will be sure to wash his hands before eating because of what he learned in the video. UNICEF Cambodia is supporting this project with funding from the Australian, Canadian, and Korean Committees for UNICEF. The TV series offers an innovative method of teaching children valuable lessons about health and nutrition in a fun and engaging way. Judging by Bajamson’s reaction, it appears to be a great success. Future episodes will cover such topics as road safety, gender equality, and social inclusion, among other key issues essential for children’s healthy growth and development. UNICEF hopes to launch the series more widely in the coming months to the broader public using social media and mass media.